This is a tasty little dish to use up store cupboard ingredients – we’re moving house (hopefully!!) very soon and so this is a very handy recipe to have to hand! When you’ve made it one or two times, you’ll know which additional ingredients will go well in it, so you can start throwing in whatever you’ve got lying in the fridge! The dish itself could be very well described as a cross between a risotto and a paella – though there is none of the stirring of a risotto, and none of the seafood and delicacy of a paella. I would say that the chorizo is a must in this recipe, but really, if you wanted to chop and change the flavours, you could mix it up as much as you like. The recipe below will serve at least 4, and is ready within 40 minutes. 1. Chop the onion and add to a large casserole dish with the olive oil. Sizzle over a medium heat for 2 minutes, then add the sliced chorizo. 2. Cook until the chorizo is browned, then stir in the finely chpped garlic and smoked paprika. 3. Deglaze with the sherry, then tip in the chopped tomatoes. Stir in the rice, then add the stock, bay leaves and grated lemon zest. 4. Bring to a boil, then cover and simmer for 10-15 minutes. 5. 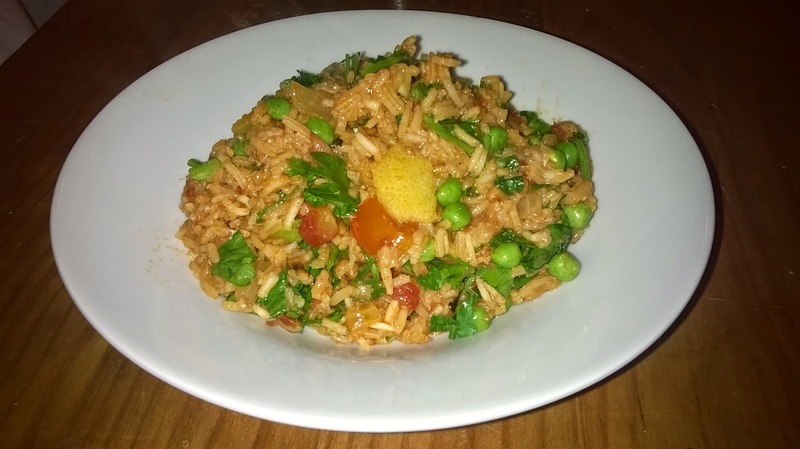 When the rice is cooked, add the peas and chopped parsley. When the peas are cooked through, it’s done!